Rylie’s Girl Scout troop worked together to learn about the water crisis and contribute to a well project. Have you ever felt like you can’t possibly make a difference? Oftentimes we feel powerless to make any lasting impact in the world we live in, but 4th grader Rylie refused to believe that. She educated others and brought people together with the common goal of raising money to build a well. Rylie proves that together we can do great things and shows that the power of determination can be stronger than any perceived obstacle. Rylie first became involved with the Water Project in 2011 while her Brownie troop was working on a badge. The girls learned about the scarcity of clean water in much of the world, and they contributed funds from their cookies sales to the project. Their contribution in and of itself is wonderful, but what is most impressive is the knowledge that Rylie carried forward from that experience. Last year her 4th grade class studied the global impact of clean water, and the children were overwhelmed by the problem. They wanted to do something to help, but they felt there was no way they could make an impact. That is, until Rylie stepped forward and told her story. Jennifer, Rylie’s Mom shares, “It’s been amazing. This is the second project we’ve done. Last spring, my Girl Scout Troop contributed funds from our Cookie Sales. The Girls Scouts have a badge that has a water component and we found your organization during that project. Fast forward to this year and my daughter’s class was studying the global impact of water. The children were distraught at how limited clean water is and how it is used around the world. They also felt very powerless to impact the issue. That is, until my daughter came back to the class with the proposal of collecting funds for the water project!!! !” If we as adults often feel powerless to effect change in the world we live in, it would seem to be even truer for children who have no perceived power for change – no consumer power, no voting power. 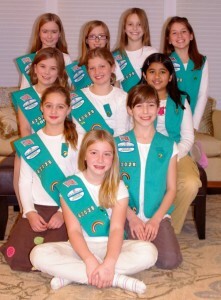 But not Rylie – she remembered the work her Brownie troop had done. She explained to the class the work that the Water Project does and suggested they collect funds. The young can inspire us in so many ways, but we oftentimes let what we see as limitations hamper their abilities and our own. We can look to Rylie to see the possible and shed our doubts. See the impact Rylie, her Brownie troop, and Anne’s 4th grade class fundraising has had; and be inspired! Rylie proves that together we can do great things and shows that the power of determination can be stronger than any perceived obstacle. Together we can do amazing things when we all do something. What action can you take?